TRENTON – The Division of Criminal Justice and the Office of the Insurance Fraud Prosecutor announced that a North Jersey chiropractor has been arrested for allegedly accepting tens of thousands of dollars in illegal kickbacks from a medical imaging center in return for referring patients to that facility. The arrest is the latest action taken by the Attorney General’s Commercial Bribery Task Force (CBTF), which was formed in January to target commercial bribery in the healthcare industry. The task force includes deputy attorneys general and detectives from the Division of Criminal Justice Financial & Computer Crimes Bureau and the Office of the Insurance Fraud Prosecutor. Dr. Kesnold Baptiste, 50, of Roselle, was charged with health care claims fraud, conspiracy, and commercial bribery for allegedly accepting money to refer his patients to a medical imaging facility owned by one of two individuals who previously pleaded guilty in a statewide healthcare-related bribery conspiracy involving dozens of doctors, lawyers, and medical facility operators. Baptiste is accused of accepting tens of thousands of dollars in bribes from Ata “Danny” Chaudhry, 55, of Paramus, who owns MRNJ Newark, MRNJ Oradell, and Hudson Radiology Center of New Jersey. 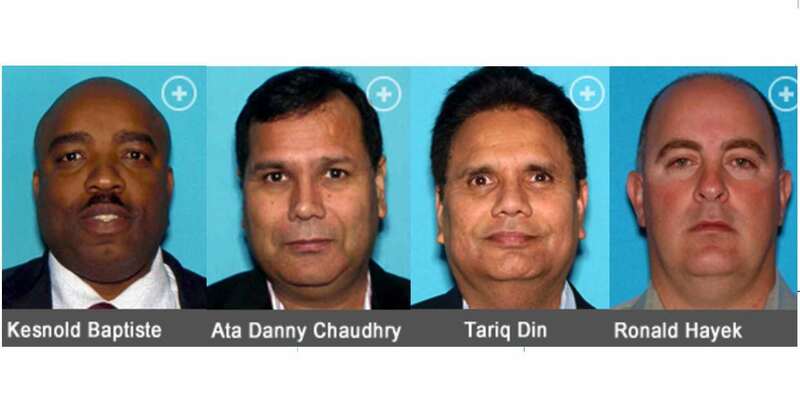 Another facility owner, Tariq Din, 48, of Paramus, who owns Clifton MRI Facility also known as Open MRI of Clifton, was also charged. Din and Chaudhry pleaded guilty last month to second-degree charges of conspiracy, money laundering, commercial bribery, and misconduct of a corporate official for paying more than $850,000 combined to more than 15 physicians and other professionals in exchange for referrals to their MRI facilities. “Operation Rayscam,” an investigation by the Office of the Insurance Fraud Prosecutor that led to guilty pleas in May 2015 from Rehan Zuberi, his wife and three other defendants in connection with commercial bribes that Zuberi paid to doctors in return for the referral of patients to his medical imaging centers. Dr. Ronald Hayek, a chiropractor practicing in Totowa, pleaded guilty on July 21 to two accusations. The first accusation, filed by the Division of Criminal Justice Financial & Computer Crimes Bureau, charged him with second-degree conspiracy, second-degree money laundering,six counts of commercial bribery, (four in the second degree, two in the third degree), and one count of third degree failure to pay taxes. The second accusation, filed by the Office of Insurance Fraud Prosecutor, charged him with one count of third-degree conspiracy. In pleading guilty to the accusation filed by the Division of Criminal Justice, Hayek admitted he accepted tens of thousands of dollars in kickbacks from Shamshair, Patharkar, Din, and others, in exchange for referring patients to them and their related medical facilities. He also admitted paying commercial bribes to attorneys in exchange for the referral of clients to his practice. In pleading guilty to the accusation filed by the Office of Insurance Fraud Prosecutor, Hayek admitted to receiving kickbacks in exchange for referring patients to diagnostic imaging facilities owned or controlled by Rehan Zuberi. Commercial Bribery Task force members Deputy Attorney General Jillian Carpenter, Deputy Attorney General Colin Keiffer, Lt. Anthony Butler, Lt. Lisa Shea, Detective Wendy Berg, Detective John Campanella, Detective Grace Rocca, Detective Anthony Correll, Detective Kimberly Allen, Detective John Neggia, Detective Jason Volpe, Analyst Bethany Schussler, Analyst Rita Gillis, and Analyst Kelley Celenza are conducting and coordinating the investigation for the Division of Criminal Justice Financial & Computer Crimes Bureau, under the supervision of Bureau Chief Michael Monahan and Deputy Bureau Chief Mark Kurzawa, and the Office of the Insurance Fraud Prosecutor. Additional assistance was provided by Supervising Criminal Forensic Auditor Debra Lewaine and Criminal Forensic Auditor Michael Birnie both of the Department of the Treasury’s Office of Criminal Investigation.